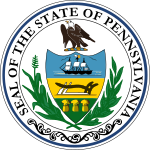 The Pennsylvania gubernatorial election of 1820 occurred on November 7, 1820. Incumbent Democratic-Republican governor William Findlay sought re-election but was defeated U.S. Representative Joseph Hiester. Findlay entered the race with significantly reduced popularity. He had been renounced in the press as an opponent of democracy due to his nomination during the 1817 campaign by a group of party insiders. He additionally faced allegations of corruption over the misappropriation of funds during his tenure as State Treasurer, although all charges were dismissed during impeachment proceedings before the State Legislature. For this campaign, Findlay was chosen for a slot on the ballot at a popular convention of Democratic Republicans; Hesiter was selected at a separate convention of Federalists and "Old School Democrats" (i.e. allies of former governor Thomas McKean). The sour state of the economy was a key factor in the defeat of the incumbent, as Pennsylvania was reeling from the effects of the Panic of 1819. ^ "PA Governor General Election". OurCampaigns. Retrieved 3 July 2012.